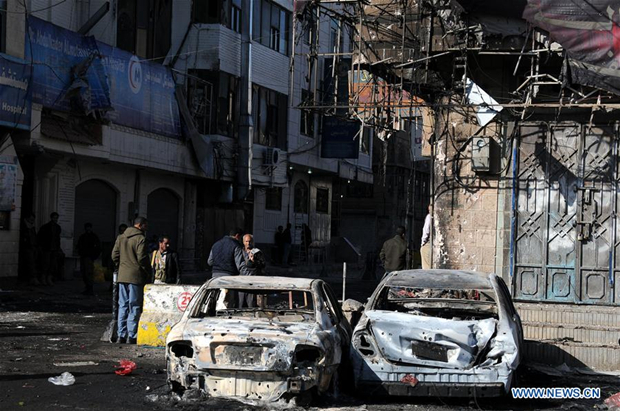 Death toll from week-long clashes in the Yemeni capital Sanaa has increased to 234, while 400 others were wounded, including 383 severely injured, the International Committee of the Red Cross (ICRC) for the Middle East said Tuesday. "Our ICRC teams are now doing all they can to supply hospitals with medicines, surgical materials and fuel," Robert Mardini, the regional director of the ICRC tweeted. On Monday, dominant Houthi fighters killed former President Ali Abdullah Saleh, his relatives and his senior aides after three days of deadly street clashes between Houthi movement and Saleh's armed loyalists in Sanaa. The clashes first erupted a week ago after Saleh's loyalists prevented Houthis from entering a Saleh-run mosque to secure a nearby religious celebration organized by the group in Sabeen Square in central Sanaa. The clashes then intensified and turned into street fighting after Saleh on Saturday announced disengagement of his alliance with the Houthis and declared war against them, citing allegedly "Houthi assaults on his family members." Hours after Houthis announced the death of Saleh, the Houthi leader Abdul-Malik al-Houthi made a televised speech, saying his group had "foiled a plot by ex-president Saleh to involve all Yemeni people in armed chaos." Houthi leader also accused Saleh of backing a Saudi-led military coalition. Together, Saleh and Houthis had aligned in fighting against the Saudi-led coalition since Saleh's loyalists backed Houthis in storming Sanaa in 2014 and forcing Saudi-backed president Abd-Rabbu Mansour Hadi and his government into exile. The clashes in Sanaa and surrounding provinces stopped on Monday following the announcement of Saleh's death, while the security situations are calm. Observers said the death of Saleh could escalate a violent sectarian proxy war between pro-Sunni Saudi Arabia and pro-Shiite Iran.